You don't have to see very many green flashes to realize that they aren't all green. If you watch closely, you'll see each flash run through a series of colors in the second or two of time that it's visible. A few flashes are blue, or even violet, although most vanish while they're still green. It's hard to catch these elusive colors. The effect of retinal bleaching distorts your color perception at sunset, so what you see isn't usually what you get in a photograph. Furthermore, there's the complication of reaction time. Finally, different color films and digital-camera detectors all see colors a little differently than the eye does. And overexposure often distorts the recorded colors. Still, with enough people out there photographing green flashes, there are good photographic records of the range of colors that appear in flashes (if you allow for the inability of photographic media to capture and reproduce the extreme saturation of GF colors). Because my pictures page contains a rather indiscriminate assortment of green flashes, emphasizing the variety of forms more than colors, I thought I'd put together a shorter page that shows the range of hues. This is it. As the simulations show, every flash starts out with an orange or red-orange center. But, because of those photographic artifacts produced by overexposure, this often comes out yellow in pictures. And, because of the retinal bleaching effect, it's often seen as yellow, as well. As examples, I'll offer two of my own flashes. 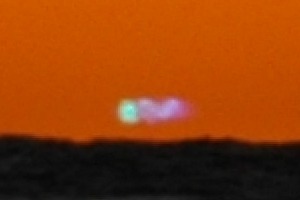 At the left here is an inferior-mirage flash that's overexposed in the middle, producing a little yellow dot. Both these flashes show a nice green hue in the outer parts. Both were taken on Ektachrome 64T film, whose color balance more nearly resembles that of the Sun-bleached retina. (That tends to make the sky more orange and less red, however.) 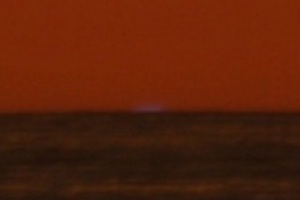 And the inferior-mirage flash even shows a hint of blue at its faint right end (take a close look). Besides the green shown in the two flashes above, there's also a nice green hue in a mock-mirage flash I took from Alpine, CA, in April of 1998. Here the green part is darker, partly because the extinction was less than in the previous example, so I had to reduce the exposure more. 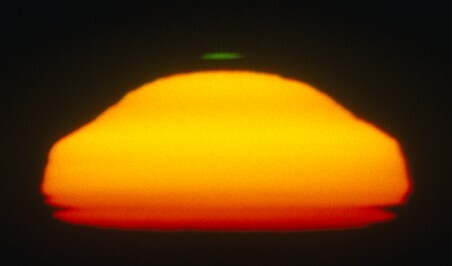 Even so, the disk of the Sun is artificially turned yellow. Note how much redder the extreme limb is: because of limb darkening, the edges of the image are properly exposed, and show more nearly the correct hue. Another splendid green color is shown on a page by Mila Zinkova, who has a fine collection of GF photos. It's hard to capture this change in hue during a single flash on film, because you have to take a second to advance the film, and by the time your finger is back on the shutter release, the flash is usually gone. But with a digital camera, it's possible to shoot fast enough to capture it. 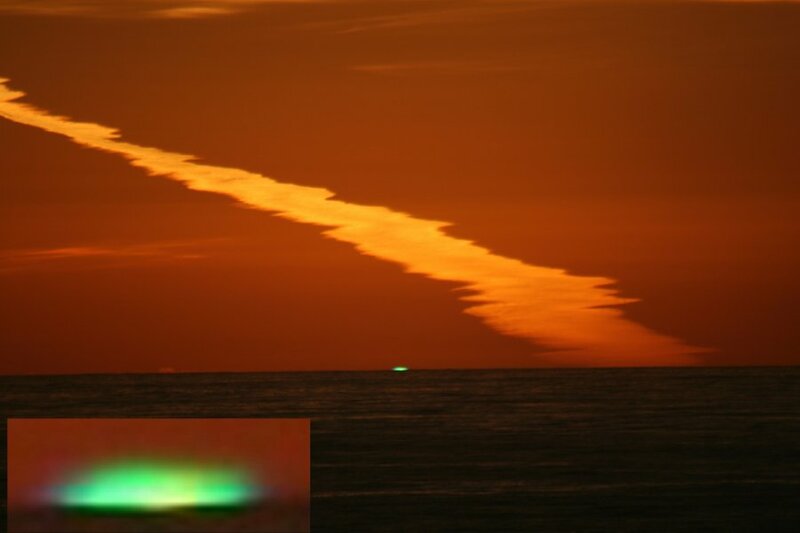 Mila Zinkova has caught the changes in color of a single flash near Santa Cruz, CA, on Jan. 28, 2006. You can see the setting of this flash in the full-frame image on another website. Here, I'll throw away the picturesque enlarged contrail that first drew her attention, and concentrate on the setting Sun. In the first two frames, the center of the image is greatly overexposed, so it comes out white. (The exposure was correct for the cloud, not for the Sun.) But you can still see a trace of the Sun's color at the very edge of the image (in the top center), where the limb darkening allows the true orange color to appear. 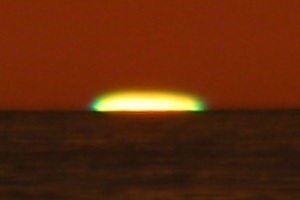 And, even in these first frames, you see the thickened green rim becoming visible at the ends of the solar segment. The third and fourth frames have most of the bright disk hidden, so the overexposed part of the image now appears yellow instead of white. 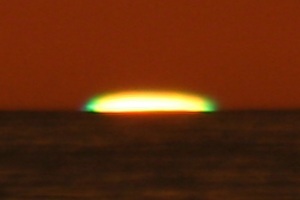 While there's clearly some vertical stretching of the image, this isn't a typical inferior-mirage sunset. 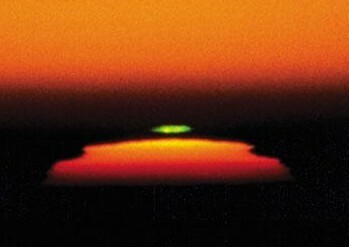 Maybe it's a green rim with enhanced dispersion, due to looking through a surface-based inversion, which would prevent the mock mirage from being visible. We seem to have some looming (image stretching) here, but no miraging (image inversion). 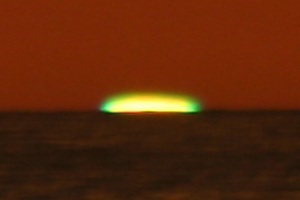 The fifth and sixth images show the transition to the full green flash. The fifth still has a little yellow in the middle, but it's entirely gone in the sixth. Look closely at these two images, and you'll see a trace of blue at the faint outer ends. 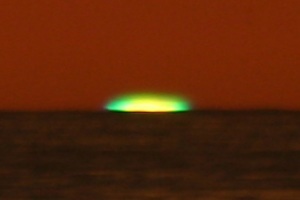 We're beginning to see this green flash become a blue one. Finally, in Mila's last frame, you can see just a little wisp of violet at the horizon. This is the faintest trace of a flash I've ever seen captured; it's almost gone here. If we didn't have the earlier frames to show where to look, we'd miss this. Martin Rietze's photos of “blue” flashes also show the progression from a cyan or slightly greenish blue to a more violet hue; you have to click on the small pictures at that link to see the details. In extremely clear conditions, it's possible to capture a good blue, and even some purple. The latter is often called a “violet” flash; but, because of the red light added by the sky, and the faintness of the flash at this stage, the resulting hue really is purple. Here's a splendid example, caught by Rod Hepburn at Point La Jolla, near San Diego, on Feb. 18, 2006. For comparison, see the simulations that show the colors to be expected in very clear conditions, when the longest wavelength remaining in the center of the flash is around 510 nm. (Those are the little pictures near the lower left corner of the array of simulated images.) It appears that the left end of Rod's flash was still showing about 530 nm light, while the fainter part on the right showed wavelengths no longer than about 500 nm. It's very unusual to see wavelengths this short at sea level. Notice that the flash is barely brighter than the sky. The shape of this flash is not at all as tidy as those in the simulations. That's because the large difference in temperature between the water and the much colder air that had moved down the West Coast from Alaska was driving very strong convection. The thermal turbulence distorted the image badly. The folding-over of the image at the same altitude as the middle of the flash is very evident in the high clouds to the left of the flash. The diagonal cloud near the left edge, which is bent into a reversed “C” shape by the mirage, is very reminiscent of Wollaston's drawing of the oar of a barge on the Thames, similarly distorted by the inferior mirage over water warmer than the air. This image also shows the peculiar distortions of the sea horizon produced by the inferior mirage. 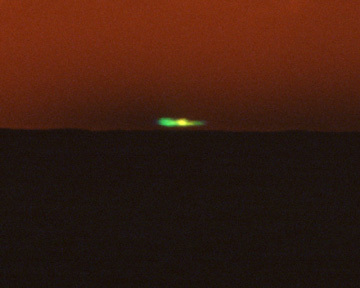 Some additional fine examples of blue and purple flashes are shown in Robert Wagner's page of green flashes taken from Roque de los Muchachos Observatory in the Canary islands. In both these last two examples, the clear air of a mountaintop observatory has allowed the short wavelength to be seen very clearly. Many thanks to both Mila Zinkova and Rod Hepburn for allowing the use of their photographs here! Please respect their copyrights to the original pictures.